The dispassioned produce the best bios. Anderson’s films are about imagination. They catch the infinite possibilities of the mind, but always display a pessimism, a kinda shame at the inability of the protagonists to fit in. At that, Anderson films can only be watched in 5 minute intervals, pacing and ideas follow, and then the film continues, but Anderson’s complete lack of interest in India is shocking, no characters pop up like a Mira Nair film, very little of India is actually shown, and the emotional issues remains unresolved. One wishes that Anderson, like his characters, could find his fellows and move on. He’s a great film maker with an excellent pastiche, but he needs to move into deeper waters if his work is going to survive. The same archetypes treading the same terrian, the exotic as a means of escape, these won’t help him here. Burns’ work can either be amazing, or well dissapoting. Black Hole is probably his worst work, it lacks any tension, while it’s cool that Burns doesn’t make the mysterious teen plague a plot point, the characters stories (with the except of Chris’ story) never really go anywhere. We’re just immersed in a world of outcastes, marijuana, and high school kids partying. I’ve gotten used to comics being good rides like Rutu Modan’s Exit Wounds or Persepolis, but Burns shows that even founders of the form can falter. Comic books have become part of my steady diet of reading material. Between academic survies, the economist, and the occasional art or book review my reading has become dry to the point of needing some small, fresh, entertainment and in the case of these books they might be a little enlightening. 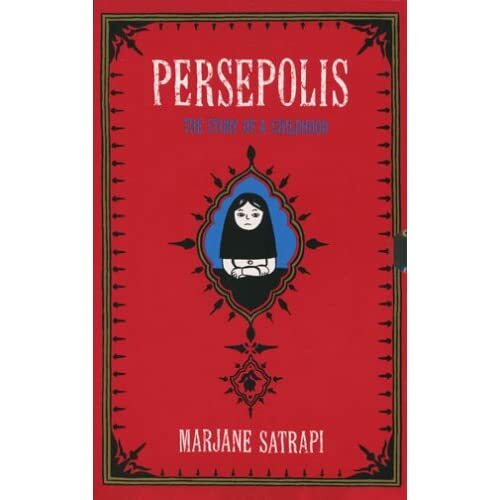 Marjane Satrapi was born in Tehran (interestingly I meet a jew seller from there the other day) and her book Persepolis is memorable not just unique for having the setting of being the daughter of a liberal family in post-revolution Iran, but for her tone which unwinds her story in slow arcs of minor maturity moments and humor. Ms. Satrapi is a good story teller and her book has an appeal similar to Art Spielgman’s Mouse books. It lacks the perspectives that other stories have (Ms. Satrapi spends little time envisioning the lives of Iran’s willing revolutionaries) , but it is a memoir and hence might be strengethened by restricting the POV. Like a good conversation you walk away entranced wishing everyone you know was this interesting. Anything by Clowes is memorable, but Ice Haven might stand above other Clowes books becuase for a second Daniel lets the seams through. Ice Haven is haunted by the comic critic Harry Naybors who explicates his theories on comics providing a kind of reflevitity that might reveal some of the author’s own polishings of the comic form. 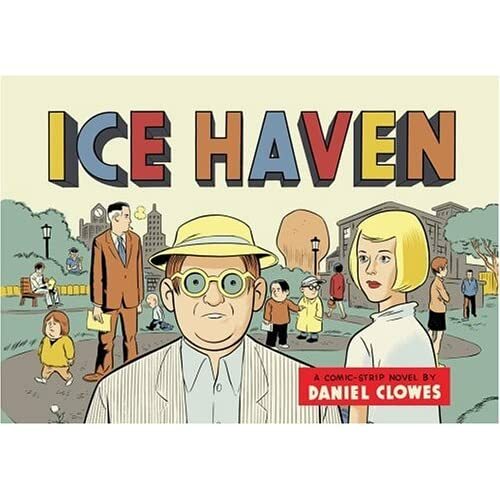 That said, Ice Haven’s story lacks the turns of Like a Velvet Glove or David Boring, but like all Clowes each panel feels intentional and different comic forms are used to express the magnificent differences between characters mental states and misinterpretations. For instance Vida, an aspiring writer, gives Random Wilder a collection of her writing. Overcome by Vida’s talent ilder throws it away in a fit of depression only for Vida to find the book and assume Wilder threw it away in disinterest. Many of Ice Havens plots and sub-plots are a tad cliched (the above reminds heavily of Henry Fool and in turn etc. etc.) and the murder story doesn’t quite enthrall, but Clowes managesto bring so many varied personalities to life while writing with a fluid by concious use of the form for meaning that Ice Haven’s meager 89 pages could be read several times before any coherent meaning might emerge. Mr. Clowes is one of the better authors in the world today and this is another collection worth taking in. On another note a friend of mine once meet Daniel Clowes and thought he would immediately take a shining to her becuase of their similar tempermants, but walked away feeling like he only saw her as just another one of his characters. I shy away from stuff with a strong Jewish identity. I have no interest in exploring an ethnic heritage regardless of how storied it might be, but Joann Sfar’s book goes well beyond the constrains of ethnic fiction prefering to use Jewishness as a spring board for excellent characterization and simplistic tales of malevolence punctuated by an energetic plot. 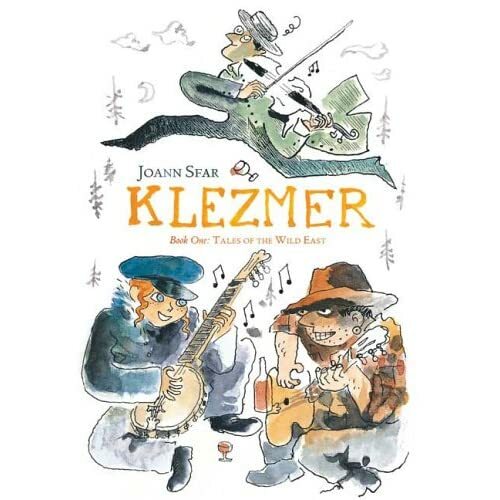 Klezmer is the story of the only survivor of a polish klezmer band, two theives thrown out of their schools, a woman who runs away from home, and a gypsy with a good amount of street sense. Sfar additionally has painted each panel in water color obscuring detial to further add accentuate the simplisticity of his stories, but taking in the depth of his characters. Like Persepolis, Sfar is probably a highly skilled conversationalist who can tickle your humor, play on our passions, and ultimately win us all over. His characters are larger than life, but Klezmer is perhaps about that moment right before the music takes us, we are stuck in a giant hopefull arc of emotions that doesn’t dissapate, but only like a well improvised klezmer piece, builds on each piece untill it’s absurdly rickety frame work is held aloft by the belief of the audience alone.